Sara Anderson will walk the 54.5-kilometre West Highland trail in September, and her grandfather is excited for her. “Every time I mention it he brings out the big Scotland map he’s got and traces out the route,” she says. Anderson’s grandfather developed a fierce love of Scotland when he began to explore his family’s genealogy. Despite his fascination with his ancestral home, the father of five never found time to visit it. “He just passed on the history and love of Scotland to the rest of the family,” says Anderson. His enthusiasm has inspired Anderson, a 26-year-old bachelor of science student at Athabasca University, to visit Scotland twice before — but this time she’s on a mission. “I wanted to bring part of Scotland back to my grandfather,” she says. The West Highland Trail is a footpath that runs from Milngavie, just north of Glasgow, to Fort William at the foot of Ben Nevis. The route, which tracks the banks of Loch Lomond and weaves through mountains and moorlands, is one of the most beautiful and historic in the United Kingdom. Anderson plans to bring back photos, a video diary and plenty of stories to share with her grandfather. The trek will take Anderson seven days to complete, and she’ll spend much of it outside her comfort zone. She’ll need to get used to “wild” camping, which is a Scottish term for camping outside a designated campsite — only one night will be spent at an established campsite. “Usually I’m at a campsite that at least has an outhouse,” Anderson laughs. But her biggest worry isn’t roughing it or even ascending a notoriously steep stretch of trail called the “Devil’s Staircase,” it’s that she might hold her hiking group up — Anderson is sharing the journey with three other hikers with fundraising goals of their own. 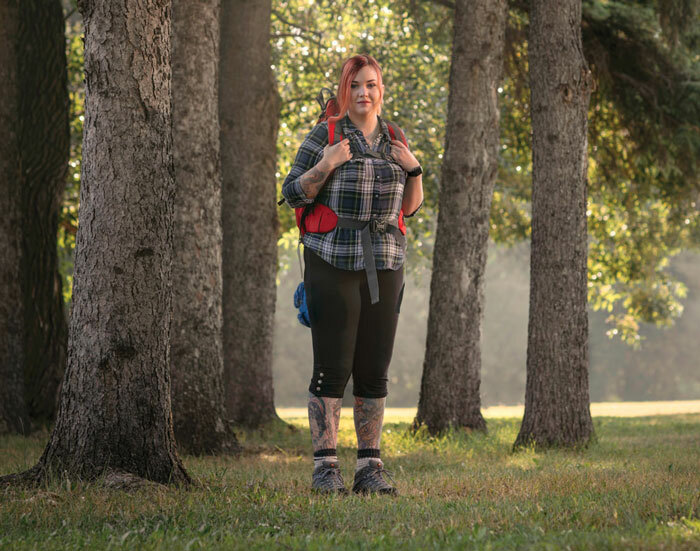 She’s determined not to slow anyone down, training with day trips in Jasper and Banff and taking free training courses on backcountry camping at Mountain Equipment Co-op.